Although high platinum prices have begun to have an impact on fabrication levels in more price-sensitive markets, demand from the jewellery sector has continued to expand during 2000. Higher sales of platinum to Chinese and US jewellery manufacturers will outweigh a decline in fabrication in Japan, with world demand rising by 60,000 oz to 2.94 million oz. 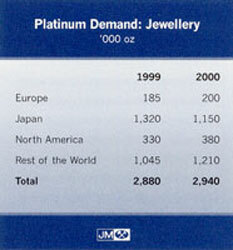 In Japan, the increased price of platinum has affected demand for inexpensive fashion jewellery. White gold has been gaining a larger share of sales of lightweight products, which are generally purchased by younger consumers for whom design and price are more important than the type of metal. However, retail sales surveys indicate that outside the cheapest category, sales of platinum jewellery were up slightly during the first half of 2000, evidence of platinum's strong position in the higher-value end of the Japanese market For the full year, we expect a modest overall decline in unit sales of platinum jewellery at the retail level. However, purchases of platinum by jewellery makers are forecast to fall more sharply. Some manufacturers still had excess platinum inventories at the start of this year, and the trade, generally still weak following the credit crisis and a series of bankruptcies in recent years, has cut back on fabrication levels. As a result, Japanese demand is expected to contract by 170,000 oz to 1.15 million oz. Platinum fabrication in Europe is concentrated in four countries: Germany, Italy, Switzerland and the United Kingdom. Statistics from the UK Assay Offices show that the weight of platinum jewellery hallmarked in the UK in the first nine months of 2000 rose by 34 per cent, putting it on course for an annual demand of 40,000 oz. An upturn in the production of platinum watches in Switzerland is mainly due to economic recovery in South East Asian countries which are important export markets for Swiss manufacturers. With small increases in platinum jewellery production in Germany and Italy, total European demand for platinum is expected to rise by 15,000 oz to reach 200,000 oz. Demand for platinum from North American jewellery manufacturers is forecast to rise by 50,000 oz to 380,000 oz. Platinum is now firmly established as a premium jewellery metal in the USA. Sales of platinum items have increased steadily, mainly on the back of demand from the bridal sector, although the range of necklaces and other jewellery accessories on offer has been expanding gradually. The only discernible effect of higher metal prices has been to make it harder for American manufacturers to meet the price targets which mass market retailers set for the products they sell. This has been an incentive for increasing imports of lower priced platinum jewellery, particularly from China and India. Fabrication of jewellery in China has continued to expand and is expected to reach 1.1 million oz in 2000, an increase of over 15 per cent While consumer demand for white metal jewellery remains extremely strong, high platinum prices have slowed the rate of growth in fabrication. Retail prices for platinum have edged up only slowly in response to higher bullion prices, and some manufacturers have found it difficult to maintain profit margins. Consequently they have been meeting some of the demand for white metal products by increasing their use of white gold, mainly at the cheaper end of the market Nevertheless, platinum remains the preferred metal for white jewellery in general and for wedding rings and settings for good quality diamonds in particular. Demand in the remainder of the Rest of the World region will be boosted by rising fabrication levels in India. Here, manufacturing of platinum jewellery takes place in the country's special duty-free export zone, and several Indian manufacturers are now exporting platinum jewellery to the USA. Excluding China, demand in the Rest of the World is forecast to grow by 15,000 oz to reach 110,000 oz this year. Sales of platinum to auto makers are expected to rise by 190,000 oz to 1.8 million oz in 2000. Tighter emissions legislation and higher car output will boost consumption in Europe, Japan and the Rest of the World region. In North America, actual use of platinum in catalysts will decline, but demand will be augmented by purchases of platinum for strategic stocks. European demand for platinum in autocatalysts is forecast to rise by 70,000 oz to 630,000 oz in 2000. With European car production and sales expected to rise only slightly this year, legislation will be the main influence on pgm use. Stage III EU legislation was introduced for new models from January 2000, and will affect all new vehicles from the beginning of next year. However, many vehicle manufacturers have opted for early compliance with the new regulations; indeed, some are already fitting cars with catalysts capable of meeting even stricter emissions limits. We estimate that over 50 per cent of cars sold in Europe this year will meet Stage III or tighter standards. 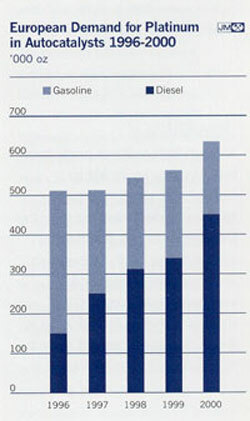 For platinum, the principal impact of the new legislation has been in the diesel sector. Average platinum loadings have increased sharply, and this ?combined with a 13 per cent increase in sales of diesel cars is expected to increase the use of platinum on diesel vehicles by almost a quarter in 2000. In contrast, demand for platinum in the gasoline sector will decline this year, since most manufacturers have chosen to use palladium-rich catalysts to meet Stage III limits for these vehicles. In recent years there has been a significant switch from platinum to palladium technology on gasoline cars in Europe: this is now essentially complete. Looking ahead, high palladium prices and concerns over the security of supplies are encouraging car companies to reassess their catalyst strategies, and from next year we expect to see the start of a gradual return to platinum. Changes in legislation have had a positive impact on platinum demand in Japan this year. Japanese Low Emission Vehicle (JLEV) standards were imposed from October 2000, but even before this deadline many car companies were fitting vehicles with catalysts capable of meeting the new standards. With the introduction of JLEV, some companies have chosen to increase loadings of platinum rather than of palladium, in order to bring the pgm mix in their catalysts closer to mine production ratios. A recovery in the Japanese auto market has also played a role in boosting platinum demand, with both sales and production of passenger cars expected to rise by around 5 per cent in 2000. Total consumption of platinum by Japanese auto makers is forecast to rise by 25,000 oz to 275,000 oz this year. Sales of platinum to US auto makers are forecast to increase by 55,000 oz to 590,000 oz in 2000. However, this total includes some additions of platinum to strategic stocks; actual use of platinum on autocatalysts is expected to fall slightly this year. The decline in underlying consumption is due to the adoption of palladium-rich catalyst systems in order to meet Low Emission Vehicle (LEV) standards, a trend which has reduced platinum demand in this region by almost a third from its peak of 850,000 oz in 1996. We expect platinum to begin to regain ground from next year, with some car companies planning to add platinum to their catalyst systems in order to reduce their dependence on palladium. In the Rest of the World region, demand for platinum in autocatalysis is forecast to rise by 40,000 oz to reach 305,000 oz. This gain is due to a combination of rising vehicle output and tightening emissions legislation, partly offset by further adoption of palladium-rich technology in some markets. Demand for platinum from Korean auto makers is set to rise this year, with the introduction of stricter emissions standards from January 2000 leading to an increase in platinum loadings. India also tightened its emissions legislation at the beginning of this year, moving to standards based on European Stage II, while in China standards equivalent to EU Stage I were applied across the whole country for the first time. In Latin America, platinum consumption will be little changed this year. Although sales to auto makers in Brazil and Argentina will rise, principally due to higher vehicle output, this will be offset by lower demand in Mexico. Many vehicles produced in Mexico are destined for sale in the USA, and there has been an increase in the use of palladium-rich catalysts to meet US LEV legislation. The recovery of platinum from spent autocatalysts is forecast to rise by 35,000 oz to 460,000 oz in 2000. Most of this metal will come from vehicles scrapped in North America and Japan, although autocatalyst recovery is gradually becoming more significant in other regions. In the USA and Japan, a high proportion of scrapped vehicles have their catalytic converters removed and recycled. Variations in the amount of platinum recovered therefore reflect changes in the number of vehicles reaching the end of their lives, and the amount of platinum on the catalysts. 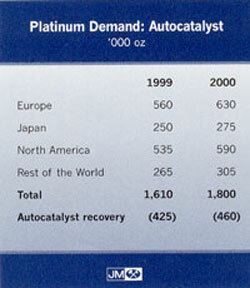 In 2000, autocatalyst recovery of platinum in North America is forecast to rise by 6 per cent to 340,000 oz. This reflects increases in platinum loadings that took place following changes in Federal emissions legislation in the early 1990s. In Japan, the recovery of platinum from spent autocatalysts is forecast to be stable this year, with weak economic conditions encouraging consumers to keep their vehicles longer before scrapping them. European recovery of spent autocatalysis is concentrated in Germany; in the region's other large auto markets, only a small proportion of catalyst scrap is collected and reprocessed. Nevertheless, platinum recoveries in Europe are expected to rise in 2000, mainly because vehicles scrapped this year are more likely than in the past to carry a catalyst. Industrial demand for platinum is forecast to increase by 105,000 oz to 1.46 million oz in 2000, with rising consumption in the electrical and glass sectors offsetting lower use in the chemical industry. 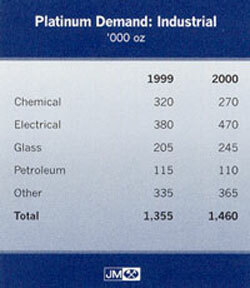 Demand for platinum in the chemical industry is forecast to decline by 50,000 oz to 270,000 oz in 2000. The European nitric acid sector remains depressed due to the availability of low-priced ammonium nitrate fertilizer from former Soviet countries. This has resulted in the closure of nitric acid plants in several counties, including the UK, Sweden and France. The market has also been weak in the USA, with smaller nitric acid plants being closed in favor of larger, more cost-effective facilities. In the process catalyst sector, the production of specialty silicones continues to dominate platinum demand; consumption in this application is expected to show modest growth this year. However, this will be offset by a fall in sales of platinum catalysts used in the manufacture of paraxylene. In the electrical sector, demand is predicted to expand by 90,000 oz to 470,000 oz in 2000. The key contributor to this growth is the computer industry, which uses platinum in hard disks in order to improve data storage capacity. This year, we believe that more than 90 per cent of all hard disks will use platinum, up from around 75 per cent in 1999. The average platinum content of each disk is also rising as manufacturers strive to offer greater storage capabilities. In addition to these technical factors, demand has been boosted by strong growth in the personal computer market: sales of PCs are reported to have risen by more than 15 per cent in the first half of 2000. Other electrical applications will make a more modest contribution to higher demand. Growth in worldwide auto production has boosted steel output, thereby increasing consumption of platinum in thermocouples. Demand for platinum in fuel cells has also risen, though the total is still small. Major automotive and petroleum companies continue to invest heavily in fuel cell research, and obstacles to commercialization are gradually being overcome. The choice of fuel remains a key issue, and this year several industry partnerships have announced plans to develop on-board reformers that will enable fuel cell cars to use liquid fuels such as methanol or gasoline. During 2000, a number of major car companies have demonstrated vehicles powered by fuel cells, though current prototypes generally carry a hydrogen tank rather than an on-board reformer. Demand for platinum in the glass industry has benefited from the boom in the personal computing sector, with strong demand for liquid crystal displays (LCDs) used in laptop and handheld computers, and digital cameras. LCDs are also finding increasing use in desktop PCs and televisions, which typically have wider screens and therefore require larger glass panels. As a result, LCD glass manufacturers in Germany, Japan, Korea and the USA are adding capacity at the moment. Total demand from the glass industry is expected to rise by 40,000 oz to reach 245,000 oz in 2000. Sales of platinum to the petroleum refining industry, at 110,000 oz, will be similar to last year. Consumption in the Rest of the World region has again been strongest, largely due to purchases of catalyst for new refineries in India. Other applications are expected to consume 365,000 oz of platinum in 2000, a rise of 30,000 oz. This demand sector continues to be dominated by platinum's non-catalytic automotive applications. In Europe, the use of platinum in oxygen sensors has been boosted by the imposition of Stage III automotive emissions legislation. Under these regulations, manufacturers have been required to fit on-board diagnostic systems to all new models since January 2000; this has led to an increase in the average number of sensors per vehicle. The use of platinum in spark plugs is also rising, as manufacturers adopt long life components which are consistent with servicing intervals and durability requirements for modern vehicles. Net demand for platinum in investment products is forecast to be negative this year. Higher bullion prices have encouraged Japanese investors to sell substantial quantities of platinum, in the form of large bars, back to the market. Sales of bullion coins have fallen sharply, although demand for proof coins is likely to be stable this year. Demand for platinum in coins and small bars is expected to halve in 2000 to just 45,000 oz. This figure assumes that the US Mint will sell all of this year's issue of 26,850 oz of proof platinum Eagles, which went on sale late in September. Sales of platinum bullion coins have fallen again this year; few Australian Koalas or Canadian Maple Leafs have been minted, while sales of bullion platinum Eagles amounted to only 18,000 oz during the first nine months of 2000, down from 59,000 oz in the same period in 1999. Since its launch in 1997, the US Mint's platinum Eagle program has been supported by a loan of just under 200,000 oz of metal from the US Defense Stockpile, which has provided a working pipeline of metal. However, in February this year it was reported that the Defense Logistics Agency (DLA) had requested the return of this platinum, part of which will be sold under its Annual Materials Plan for the fiscal year to October 2001. The withdrawal of the loan creates a problem for the US Mint, which will need to buy metal if it is to continue minting platinum coins. In these circumstances, the production of bullion coins may no longer be viable, although the higher mark up on proof Eagles should enable the Mint to continue this program, which is currently scheduled to run until 2002. 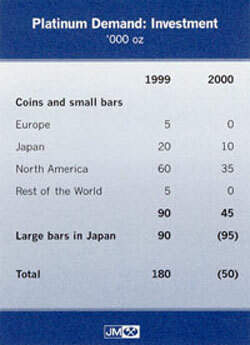 As a result of much higher platinum prices, demand for large platinum bars in Japan is forecast to be negative this year. During the first nine months of 2000, new purchases of 500g and lkg bars by Japanese investors were substantially outweighed by the selling back of bars bought in earlier years at lower prices. Assuming that the price of platinum remains close to Y2,000 per gram, the level recorded at the end of September, we believe that net sales of platinum bars back to the market will total 95,000 oz this year.